I'M CREATING AN ORACLE DECK! I've finally started working on a dream project of mine after years and years of thinking about it and chasing concepts. I fell in love with the concept I am currently working on after finishing my #100DaysOfInkedAstronomy project on instagram last year, I looked at all the constellations I had illustrated and felt like I needed to make a deck from them. So how come it has taken me over a year to start? Well I loved the concept but didn't love the original aesthetic of black and white ink. I've unknowingly been experimenting with different art mediums over the last year to find what I like and while I was experimenting with some watercolour, it just felt like it all clicked into place and the first draft cards of The Celestial Spirit Oracle were born! 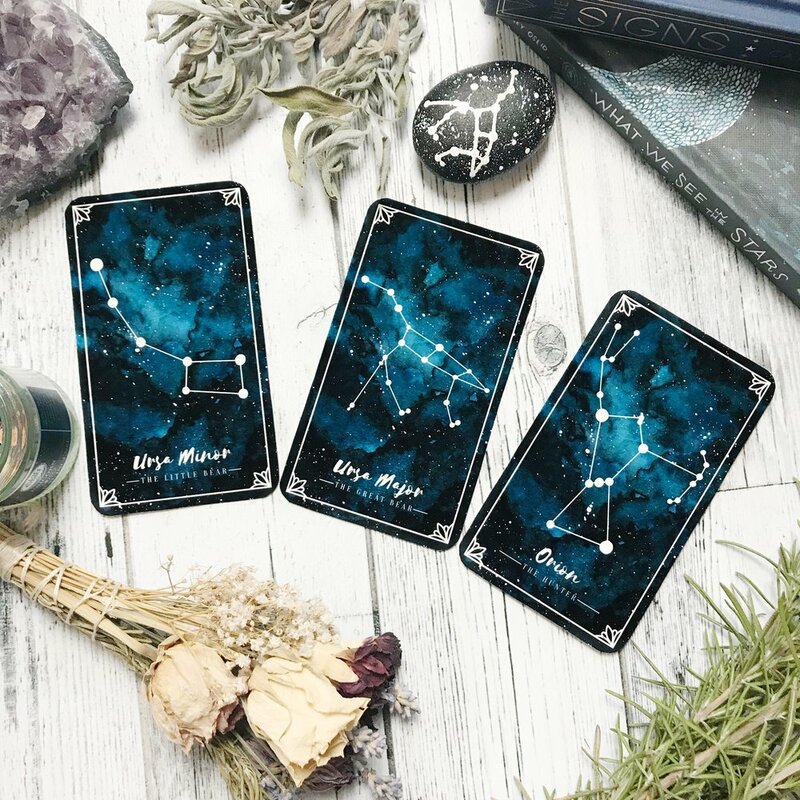 This deck connects us to all the constellations. All the starry guardians that watch over us, so that we may communicate with them and receive guidance. There are many lessons written for us in the stars, it's time we all start looking up more to connect with these wise spirits. The Celestial Spirit Oracle will be standard tarot size and have 88 cards, one for each constellation in the night sky. Each card will show a depiction of a certain constellation with its name and description written underneath. I plan on writing a booklet of card definitions and spreads to accompany the deck in PDF form, I'm also hoping to source some cloth drawstring bags to house the deck. As I write this there are now eight cards (which I will be showcasing on my instagram later today! ), so there are still 80 cards left to design, plus a booklet to write, and a printer to source. It's still a little while off before this deck will be available to purchase for yourselves, but I will be doing some research into crowdfunding the deck or opening it up to pre-orders so that the initial costs of getting it produced are covered! Of course I will keep you all updated on here and on my twitter/instagram. Once I have a better idea as to when I can release it and what price it will be, you will all be the first to know! I hope you're all excited as I am to see how this deck develops! 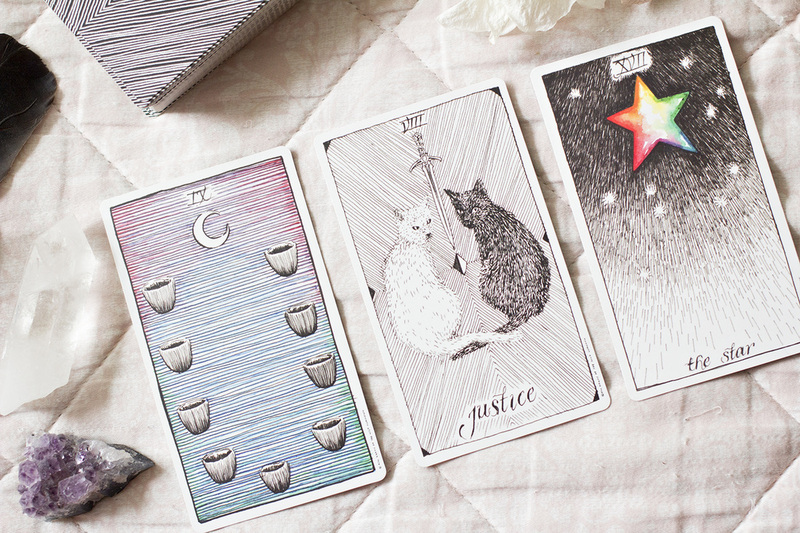 Today I wanted to share my current favourite tarot spread with you all! This is a spread designed to help you communicate with a menagerie of beings, from deities and angels, to spirit guides and even the universe! A great thing about this spread is that you can do it as little or often as you like, if you want to check in daily with your spiritual team for guidance then it's perfect, but it's equally perfect as a way to seek guidance from your guardian angels every now and again. So lets move onto the spread! This is a three card reading and you can use any deck you like, even digital ones like phone apps work! What I like to do is ask whoever I'm trying to contact to communicate with me through the deck, then I begin shuffling while thinking of my questions. Once it "feels" right I stop, cut the deck and draw three cards. CARD ONE: WHAT ISSUE ARE "MY GUIDES" HELPING ME WITH NOW? CARD TWO: WHAT DO "MY GUIDES" WANT ME TO KNOW? CARD THREE: HOW CAN I BETTER CONNECT WITH "MY GUIDES"? I've put "my guides" in quotation marks as a marker that you can replace this bit with whatever fits for you, it could be your angels or the name of a deity you work with! What I love about tarot spreads is that they are pretty damn versatile, once you find a particular one that resonates with you it can be chopped and changed in any way to fit your intention or question! FUN IDEA Research into a pop-pantheon or pop culture-pantheon! Once you identify some popular culture characters or historical figures you idolise, you can ever communicate with them on relevant matters! Getting art advice from Frida Kahlo, heck yes! I use this spread all the time and find it really comforting and helpful, so I would love if you would try it out and let me know how it goes for you! I found this spread online a long time ago but can't find the source right now, so if you're the creator please let me know so I can credit you! Hey guys, today I really wanted to share this tarot card spread that I came up with when I was struggling with artist's block! When you're suffering from a creativity block you can become super frustrated and annoyed with yourself, but I find that if you take out 10 mins or so to try and address the situation in a detached way, things can become a lot less stressful. 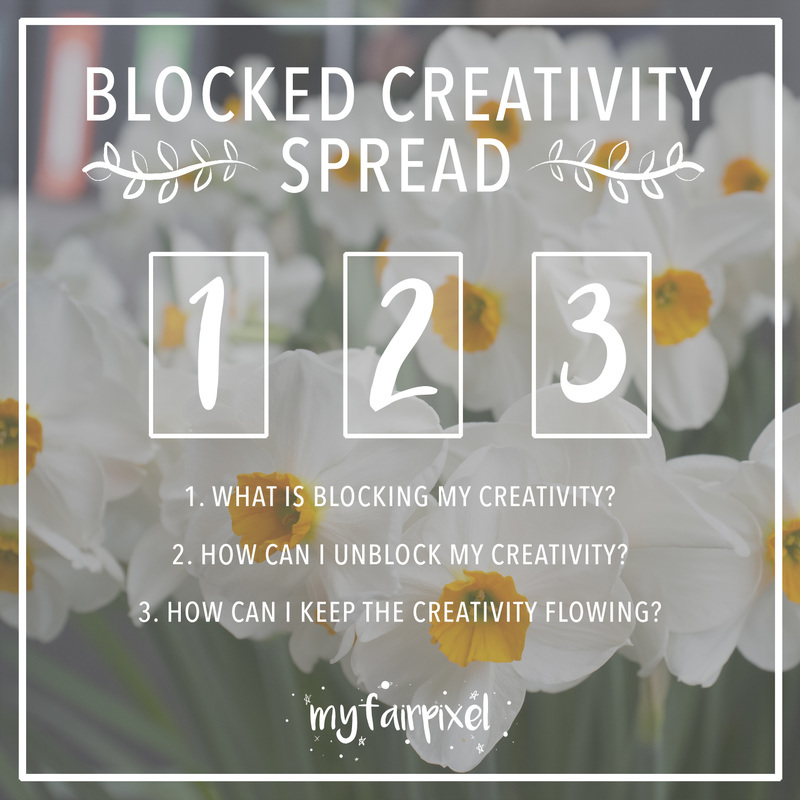 With this spread we ask What is blocking our creativity? How we can unblock our creativity? And how we can keep our creativity flowing? This spread is set up to open up a discussion with ourselves so we can identify the problems we may have not recognised before, and how we can keep the stream of creativity flowing once we've unplugged that sucker! Here are the cards that I got! WHAT IS BLOCKING MY CREATIVITY? - NINE OF CUPS I'm too set on seeing all my hopes and dreams come true. So much so that before I even consider if an illustration concept would be fun or interesting, I'm already thinking if other people would like it, buy it and get me to where I want to be financially. I need to surrender these desires more and focus on what I enjoy creating. If I illustrate purely for the love of it, not only will my creativity flourish but my hopes and dreams will be closer to becoming tangible naturally.HOW CAN I UNBLOCK MY CREATIVITY? - JUSTICE Decisions need to be made. Creative decisions, non-creative decisions, all the decisions! The more I work my brain and problem-solve, the easier it will become. When I am able to make sound decisions and trust in my own judgement, I can quickly get through ideas and already know which will make great concepts to work on and what to forget about. Through this process more ideas becomes even more ideas and the stream of creativity becomes more free. HOW CAN I KEEP THE CREATIVITY FLOWING? - THE STAR The Star is all about being hopeful and maintaining peace of mind. If I focus on cultivating my mind to be positive, hopeful and serene, then the creativity will be in full flow. Stress is a main factor that contributes to my art block, so being able to manage that gives me the best chance to avoid blocks altogether. To combat stress and promote peace of mind, I am currently experimenting with a gratitude and meditation practice. I've read that these two practices are great at minimising the effects of stress, so if it works for me they may be an invaluable way for me to keep my creativity flowing too! So thats just a quick example showing the cards I drew and my current situation with art block. I hope you find this spread helpful and if you want any help deciphering your own cards then just drop me a tweet! P.S. 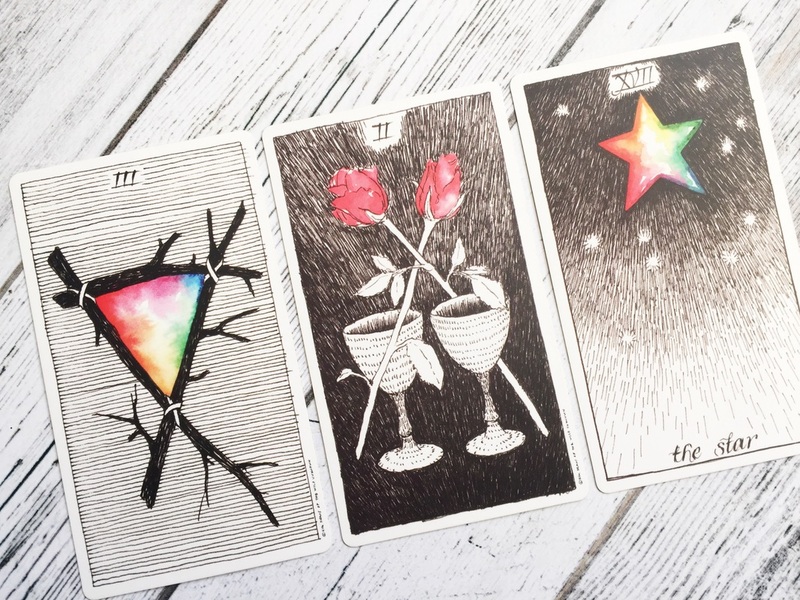 Don't worry if you don't have your own Tarot deck, there are Tarot apps that you can get for your phone that will work just as well! Hi I’m Kelly, a Cornish artist and illustrator who is currently based in Wiltshire, UK. Here I share all my latest projects, inspirations, and thoughts. Your privacy is respected and I promise you will never be spammed!